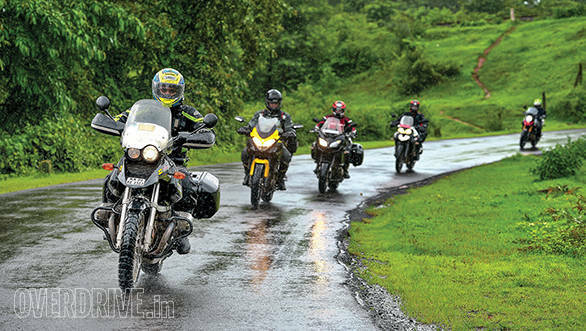 Adventure touring in Maharashtra. . . Adventure tourers. What a stupid label for a motorcycle. All motorcycling is an adventure, isn't it? And they all tour too, right? Some are effortless and others are hard work, but they all cover ground as long there is fuel in the tank. But as I discovered on this ride, behind that label hide some of the most rewarding motorcycles I've ridden to date. My personal history with adventure tourers has been, er, consistent. 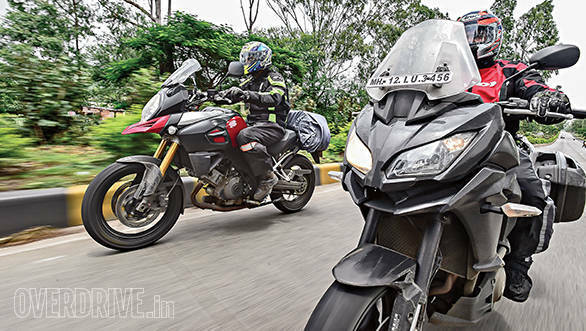 When Suzuki introduced the V-Strom 1000, I was out of town and Mody tested it. 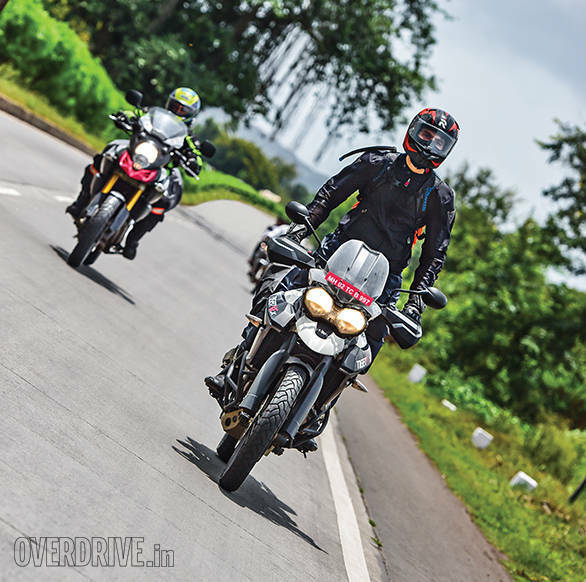 Last anniversary issue, Alan and Rishaad took the Suzuki and the Triumph Tiger to Bhatinda. Because I was out of town. More recently, Jamshed was to head to Spain to ride the 2015 Tigers because I was... yeah. But even he didn't get to ride them. He did something to his spine and had to, erm, back out. Then Kawasaki launched the Versys 1000 while I was out of town and once again, it was Daddy Long Legs Mody who tested that. "Let's head out of town!," said Halley when we were plotting story ideas and I nearly throttled him right then. But the idea was sound so Halley remained hale. 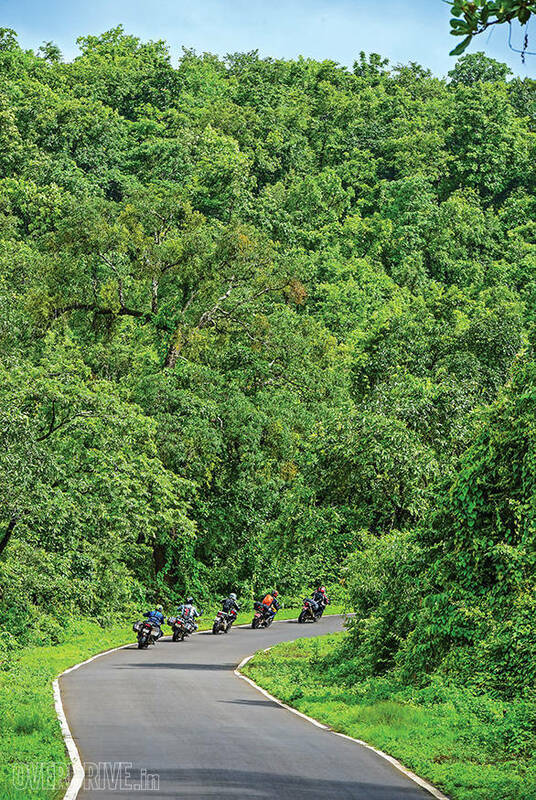 What we did was pick a road within a reasonable distance of Mumbai at random  because it looked good on the map. Our final selection gave us 75km in the city, 400km on the highway, 200km on smaller, twisty roads. And that much again to return to Mumbai. Perfect. 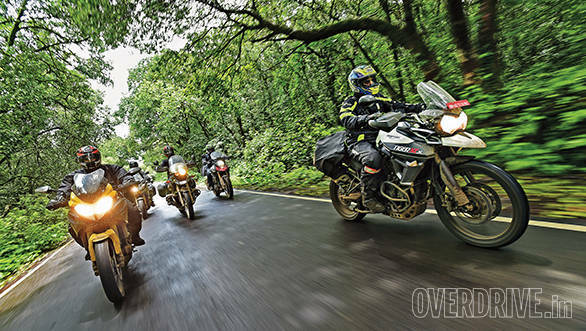 At this point, we stopped doing any further planning  whatever lay ahead, our adventure tourers would have to handle. 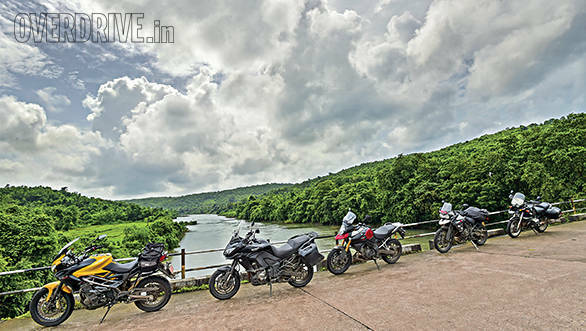 We got ourselves a 2015 Triumph Tiger XCx, the Suzuki V-Strom 1000, the Kawasaki Versys 1000 and while it hasn't gone on sale yet, the Benelli Trek 1130 Amazonas. But like Brad Pitt in Ocean's Eleven, Mody acquired a faraway gaze. "Do you think we need one more? You think we need one more." I Ocean-ed. We couldn't get a Ducati Multistrada because the new one with all the fancy electronics - evidently it is almost impossible to crash it - is set to debut in October. We'd have loved to have a BMW R1250GS too but until the BMW K03 (the bike they're working on with TVS) happens, I'm not even sure who to call to ask for a motorcycle right now. Anand Dharmaraj, Indimotard's eerily tall founder and all-round good guy, I remembered, has a well-used BMW R1150GS from 2001. 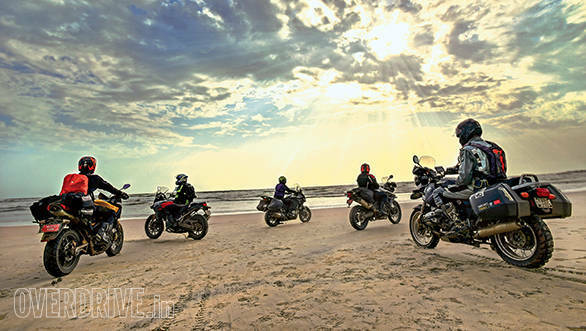 Wouldn't it make the perfect foil to the electro-wizardry of this crop of adventure tourers? Rohit opened his mouth to say something but by then I'd already made up my mind. Poor sod. Anand readily agreed to meet us at a city near our selected road and we rode out to meet him. 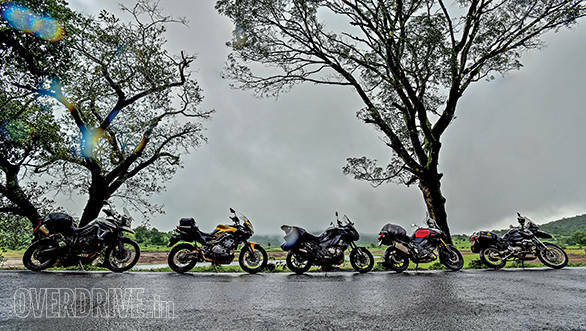 Rohit had finagled the V-Strom, I stashed my beloved Kriegas in the Kawasaki's optional panniers, Mody picked the Benelli for his new Dirt Sack Gypsy tail bag and Halley put his ViaTerra Claw on the Tiger. Epiphany One. So good are these motorcycles at highway work that I felt exactly the same when I put my helmet on in the morning and when I took it off four hours later, 400km further down the road. 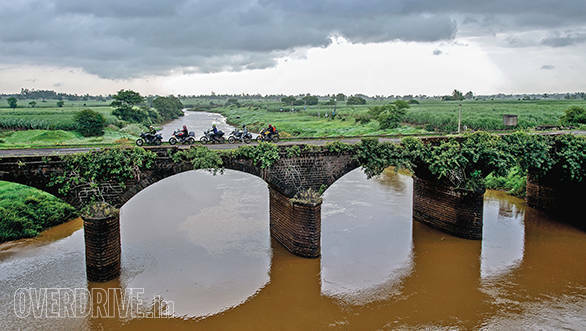 "I coulda done the 1,500km from Delhi to Mumbai in one go!," a friend had recently claimed after returning from a long trip on a recent BMW R1250GS. I'd smiled back thinking his feet looked unsightly in his mouth. But a 400km morning had convinced me that my disbelief was unwarranted. These motorcycles do have the ability to make long hauls possible and comfortable. That any of our quartet would shave an hour or more off my regular 1,000km ride to Bengaluru without any effort on my part and I'd arrive fresher to boot. We were surprised at how long we went between stops despite our high average speed but clearly, the Benelli had a problem. Anyone following it could clearly smell petrol in its breath and its fuel gauge was going flash-flash twice as often as everyone else. I asked Mody how his Trek had been so far with a very obvious smirk. "Keep smirking, there's something lovely and sporty about the Benelli that I haven't felt on the other bikes. This one needs a tune-up, is all." Oh god, we'd never hear the end of it, I thought, Parsis and their enlarged soft spots for bikes that aren't running quite right. Anand rolled into our hotel forecourt on his extremely well-kept and well-used GS looking like a complete prat in head-to-toe BMW gear. "Annai, what happened to you?," I asked with not a small amount of concern in my voice. Had he turned into the BMW owner who throws the SW-Motech and Touratech catalogues at the GS and then constantly threatens to have an adventure on it and never quite does? "No da!" Anand reassured me with not a small amount of sheepishness in his voice, "I wore out mine and a friend gave me a great deal on this suit." 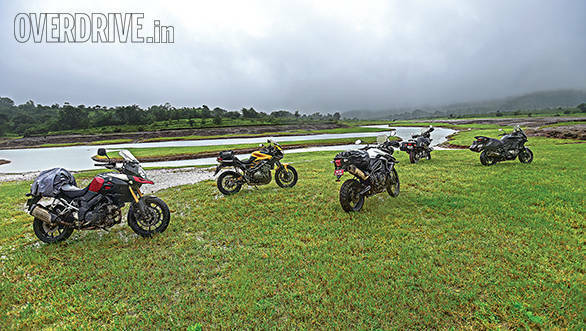 Then he spotted our bikes glowing happily in the watery sun with the muddy-mucky patina of a mid-year highway jaunt. "Lovely! Can't wait to ride tomorrow. How're the roads?," he asked. We all smiled knowing smiles back and shrugged - we really didn't know but were excited to find out. The next morning saw the five enormous motorcycles splash gleefully along in the orange sunlight. Their quiet hums bounced softly off the walls of a still sleeping city. Google Maps and I were locked in battle. It insisted that we should take its shorter, more efficient route. I snatched victory from the jaws of a reboot by not asking a curious bystander who offered the correct directions anyway. Minutes after we waved him a thank you, we were enveloped by a forest of man-sized sugarcane. Between them lay a beautiful state highway. The grey tar varied in shape from smooth to potholed but it never ran more than 200m before it changed either elevation or direction. Traffic was light, rain was intermittent and we were in heaven. Except for Mody who was cursing at having to climb in and out of waterproofs. But the man taking the cake was Rohit who appeared to have even more riding gear than, ahem, me. Every time we stopped, he was swapping gloves, adding boot covers and what have you. Groan. But whether it rained or shone, the road stayed wonderful. Our bikes took no notice of the wet road and they all hummed sweetly past light local traffic riding their individual, robust waves of torque. As roads are wont to do, now and then, they'd descend into a mass of craters filled with orange water. We would smile, stand up on the pegs and sail through smoothly. Except for Anand who mostly stood on the pegs of his GS any way. This road meanders westward gently on the top of the Deccan Plateau. When we stopped for a cuppa and local breakfast, we were all rather kicked at how good the road had been. Rohit started to say something but Anand stole the words right from his mouth, "What a road! Amazing! Sometimes I forget that not all of the best roads in the world are outside of India..."
Halley responded by opening up Google Maps and showing Anand what lay ahead. A yellow squiggle ran through a forested green set of mountains dotted by lakes small and big, a dam or two... for the next 100km or so. Rohit started to say something and we all nodded giddily back at him, "Exactly!" As we got back on the bikes, the sun went out and the clouds rolled in from the west. This sent Mody scurrying to get back into his waterproofs while the rest of us pointed, laughed and exchanged machines. I'd been on the Versys up to this point and I'd been enjoying it immensely. The Kawasaki feels like a big machine. "That's because it is!," said Halley before Rohit could point this out. In its height and demeanour, you can see the adventure tourer but I hasten to add that this generation has more of an essence of adv tourer than the real thing. The previous Versys 1000 was more properly an Adv Tourer. This one has been focussed on highway work more and you can see that in its 17-inch front wheel which looks comedy small under that angry, hungry, beaky predatory bird fairing. But it works extremely well. The 120PS, 1043cc inline four is a beauty. It's as smooth as a Pink Floyd guitar riff and as slick as a Teflon-coated ice cube. From this velvet glove comes dramatic thrust past 2,000rpm which is delivered with a lovely muted roar that grows rapidly in volume and urgency as the revs rise. If you just whack that throttle open - I did - the front wheel instantly wants to point out the constellations. A proclivity curtailed handily by traction control. Once you settle in you'll notice the flat seat, a flattish handlebar and comfy foot peg position. This is the ergonomic package that marks a purpose-built tourer. You sit upright, comfortable and it feels like your favourite armchair - minus the backrest. The massive fairing is topped by a small near-vertical screen. Two hand-tightened screws offer height adjustment and I successfully and easily got the Versys setup for a smooth but still breezy wind flow I like on hot, long rides. Perfect. "It handles very well for a machine this size," pointed out Halley. That's true. The Versys is too large and too laid back in geometry terms to be ultra-agile. But it responds smartly to inputs and quick direction changes are no trouble once you get used to the feeling of a large, heavy motorcycle flipping from lean one way to the other. The optional, Rs 90,000 hard panniers worked well too. They store a fair bit - I used only about 30 of its 70-odd litres of space. I didn't notice any significant impact on the feel. What is deeply impressive is the Versys' ride quality - I'd say it would be the best here. Sharp bumps, whether small or big, just disappear. Sort of like a plate of Biryani when Rishaad's around. Larger bumps go through an extremely effective sting extraction process. You go across a hole in the road about the size of the dinner plate and depth of a basketball and think, "That was nothing." 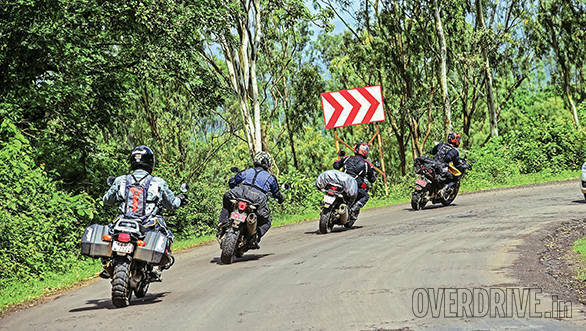 Rohit, who was taking the Versys from me started to say something, but as I started up the Benelli, I couldn't hear him in the roar of that gruff triple. Rishaad quickly hopped over, waterproofs up to his knees, interrupted by the roar of the Trek. "Shumi, remember that the bike has no ABS, no electronics. It's all about you." Yes sir, I nodded. The Benelli is the least electronic of all boasting nothing more than a button that switches between a powerful and a mild ignition map. 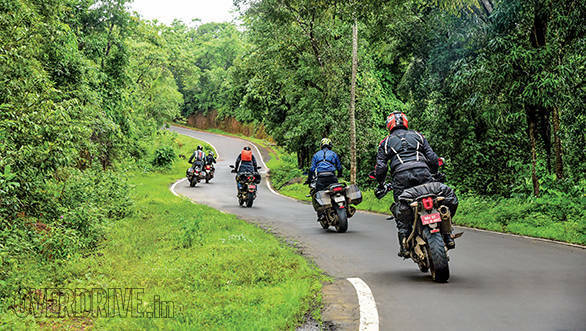 But you only notice as Rishaad did when traction goes away, "I came over a crest on the highway and suddenly the road seemed to be a lot more slippery. Then the Trek began to spin up hard and fishtail slightly. 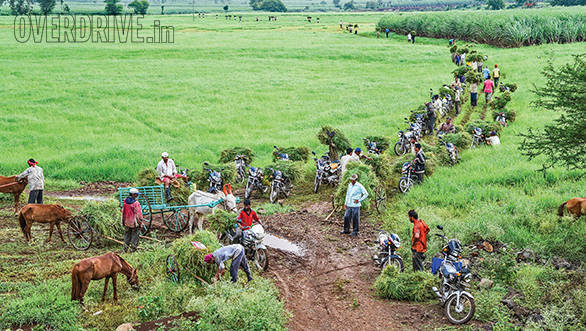 It settled once the surface changed 100m later but at 110kmph, that was scary." I know what he's saying because I hit that same patch on the Suzuki and noted the sudden greasiness in the feel of the contact patches. I didn't change my throttle position (neither did Mody) but I saw the yellow traction control light flash away for that stretch. But the rest of the time, the Benelli suspension, chassis and tyres are the highlight of the experience. The tyres are grippy and don't let go easily even when the roads are broken or you're in the dirt. The stock suspension setup was too hard though. A series of bumps would force the Marzocchis progressively to bottom. Anand borrowed a bent screwdriver somewhere along the way from a chap working on a gaggle of old Bajaj Chetaks and quickly backed both off five clicks of rebound. Which led to a remarkably more compliant ride and remarkably fewer complaints from all the riders. The 126PS 1131cc Benelli triple takes getting used to. Startup clatter and the rough sounding idle sounds off kilter to our ears. On the move, there's an insistent rasp which is lovely. "But where's the..." I agree with Rohit, the Trek, still isn't running right and there's a lack of power. It's not slow but compared to all the others it has to be worked hard and that should be unnecessary. There's definitely a tune-up required. By this point, the road was hitting its marvellous stride. Over the next 60km, there'd be a shocking lack of blind corners and only two really tight hairpins. The rest would be long, sweeping corners where the biggest problem was the stunning view that drew your eye off the road. We stopped a few corners in so that Rishaad could climb once more, out of his sweaty waterproofs. Halley quietly snagged the Benelli's keys. Rishaad noticed that and said, "Good choice machcha! It's the sportiest feeling chassis of the lot!" Rohit started to move towards the Suzuki's keys but his face fell when he realised that I already had them. 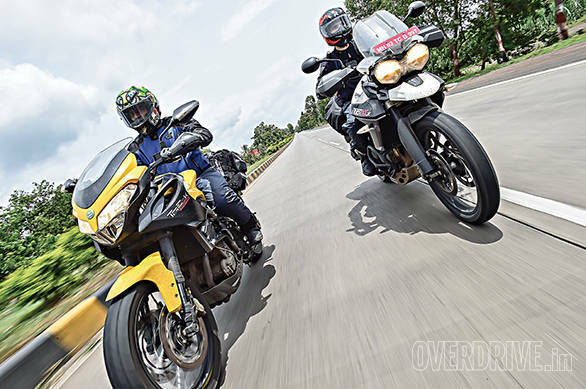 Anand took the Versys on and let Rishaad take his GS. We took it easy in the first few corners as we got used to our new machines. The Suzuki felt very nice immediately. The 101PS 1037cc V-twin makes it narrow and that makes it easy to get along with. The friendship is cemented when the V-Strom is pressed hard through the first strip of broken road where you note that the Suzuki feels, to quote Rohit, "Invincible." It has a sense of rugged indestructibility to it that led me to trust it implictly. As Rishaad noted later, "The Suzuki's very mild mannered, almost without a distinct character, no?" But it's also the bike you'll develop a deep-seated affection for as the rides and miles pile up. The V-twin does its inherent low rev judder before smoothening out as you cross 2,500rpm or so. And there's so much torque delivered so easily! Anand, who was too busy smiling to speak, actually stopped to say, "What a lovely motor! I just left in one gear [he didn't know which one] for that entire ghat and the Suzuki just pulled along wonderfully." This is spot on. I left the Suzuki in either third or fourth for long stretches of time, focussing on picking careful lines through broken roads or fast lines on good, smooth tarmac and the engine never once felt out of sorts. The Suzuki has a stiffer ride than the Versys but not by much and once again, the Suzuki's ability to absorb the road is stellar. Rohit's hands went up in that tell tale handlebar position and Halley said, "Yes, Rohit's right. It handles just great in slow as well as fast corners." The Suzuki's no sportsbike but it is certainly more than capable of charging up a mountain road with a full head of steam if you're in the mood. I wouldn't have pegged it for a soft roader on the stock tyres but it managed that too with great gusto leaving us rather fond of the Suzuki. Halley, ever the voice of testing and reason, pointed out that the Suzuki has (a few) issues. First, it isn't very pretty. The sharp beak and that upturned water drop head lamp aren't the most fetching. The rear grab rail and luggage rack are a one piece design. This is a problem. The rails prevented Halley from mounting his half-donut style ViaTerra Claw securely on the rear seat. Had they been a split design - like the Tiger, say - I'd have happily removed them and added them to the Versys' panniers until it was time to return the V-Strom. As I became more and more pleased with the Suzuki, the miles rolled by under our tyres. Sometimes the greatness of a road is raised by entire magnitudes when the right machines are used to experience it. The beauty of the scenery never waned, our bikes never flagged and we never went straight for than a new moments. We thought, literally, that we were in heaven. But the signboard said, "Beware! Bison." Ominously enough, as soon as we read that black clouds gathered and the world became dark. Rishaad rolled up beside me and screamed, "RAIN IS COMING!" Clearly he wanted to don the waterproofs once again, sigh. At this point, I was having too much fun to care about waterproofs and Halley's waterproofs had flown off his bike at some point. 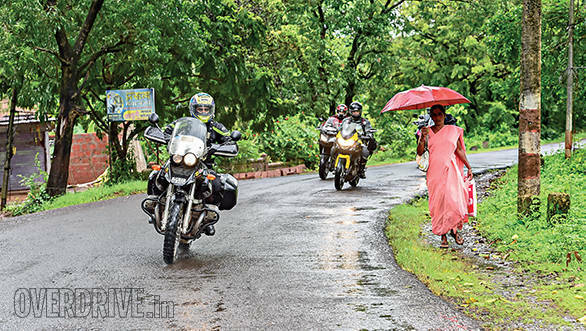 We pointed and laughed while Rohit and Rishaad put on the world famous roadside motorcyclists' waterproofs dance. Anand joined us. "Gore-Tex," he said, pointing to a label on his fancy BMW gear. In this brief entertainment, I'd quietly grabbed the Triumph's keys. I had a feeling the lightest, smallest machine on the comparo would be the right tool for the job ahead - the sharpest of the corners as we climbed rapidly down the Deccan Plateau and onto the coastal flat where we would end our journey on terrain our bikes wouldn't cross - the Arabian Sea. And of course, Tigers aren't afraid of bison. Halley seeing my furtive swipe, grabbed the V-Strom and Anand now took the Versys. We never spotted bison - just a few cows- but I did notice how much more handy and light the Tiger XCx feels. The 21-inch spoked front wheel isn't an asset on good, dry tarmac. It robs you of some feel and makes the front contact patch feel really far away. But the worse the conditions get - whether wet, dirty or both - the better that giant front wheel is able to track a line and give you confidence. I hit a giant pothole that dropped the bike lower by over a foot instantly. It was full of water and I hit it so hard that I sprayed my own helmet with the orange water coming off the front wheel. But the line wavered not a bit and the Tiger was entirely unfazed. I did notice all my colleagues blurring out in my mirrors as they shivered with uncontrollable laughter at my sudden soaking. The Tiger is the most electronic (and newest and smallest) of the bikes here. It has a by-wire throttle, ABS modes, traction control modes as well as a custom mode where you can combine the two in any which way you want. Off-road mode turns off anti-lock on the rear brakes. It also allows two seat height options and more. What I'll remember most is how light the throttle feels and how smartly the motorcycle responds to inputs. I thoroughly enjoyed the combination of the high seating position, instant throttle response and the narrow feel of the Triumph even on a fairly quick commute through Mumbai. Out on the highway too, the Tiger is extremely effective apart from the screen which moves around a little bit too much for my liking though this doesn't create any functional problems. It's a spacious motorcycle that will hold high speeds for hours as easily as it will traipse up a fairly complex off-road section easily even on stock tyres. Rohit, who'd given up trying to form words, gave the Tiger two thumbs up while Rishaad said, "Hang on, let me get out of the waterproofs first." Halley as usual, nailed it, "The Triumph is such a terrific all-rounder in this gaggle of all-rounders. It's beautifully smooth and fast on the highway, a very effective knife to slice through traffic but it really shines like a million suns on days like this when you need to trust its abilities as the road changes from wet to dry and from smooth to broken." I couldn't have said it better than that so I didn't. Instead, I finally moved Anand's R1150GS. Anand brought this bike back with him when he moved back to India about 15years ago. Why a GS? "I could have returned with anything. A sportsbike for the track or a dirtbike to go off-road. But considering how our roads are, I decided that the GS would be perfect." Since then, the hardy GS has made for itself a warm home in his heart. Many bikes have come and gone through Anand's garage but the GS has watched this parade with its mismatched eyes. Almost like the Sun watching over its solar system. When you ride it, it isn't hard to see why. The GS has a sense of laid-back, calmed-down peace about it that none of the other bikes have here. It is slower than them - that's the passage of time for you - but its essential rhythm is vastly more peaceful. The boxer thrums up to speed quickly if you want to but you'll quickly see the futility of that. Life's not short, it whispers. There's time it argues. As you would under the hands of a skillful masseuse, you let go the cares of daily life and chill out on it. It's also quirky as hell. The switches take forever to get used to, for example. The BMW Telelever front-end doesn't dive under braking which is initially super scary until you get used to it. It has ABS but it also has BMW's famous servo brakes that work terrific when the bike's on and not at all when you turn the ignition off. Not hard to see why BMW Motorrad had to normalify their bikes over the past five years in search of a wider audience. But as we wind swiftly through the brilliant coastal roads to the beach, the BMW brings home why the adventure tourer is such a popular tool. Motorcycles have become too specialised. In the same way that an oncologist can't deal with a backache and a urologist can't tackle hairfall, motorcycles have evolved into their roles a bit too well. In hindsight, a sportsbike would have bent a wheel on this ride. A cruiser would have caused physical discomfort. But the adventure tourer has become a specialist at doing many things well. In the process, they've remained easy to ride outside of their physical size - none of the bikes here are compact or small. But whether it's hours down the highway, a commute or two or heading like we did, out into the unknown, they're up for it. Once we reached the beach and the gear came off, the inevitable discussion began, what would we buy? Anand looks fondly at his GS and says, "I love all the electronics and performance on the new bikes but you know, I wouldn't move on from the GS. But I'm super impressed with the Kawasaki. 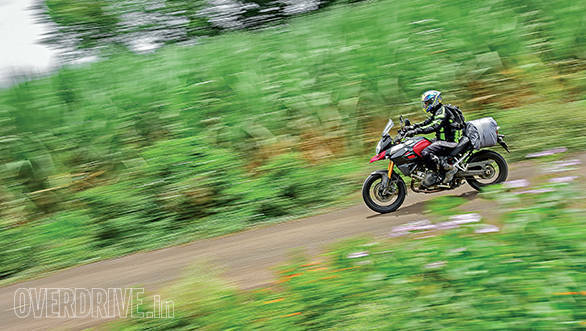 I wouldn't bad-road it but on good clean highways, that thing would be a monster mile muncher"
Rishaad's still defending the Benelli, "You all wait till we get a properly running Trek, you'll see how nice and sporty the bike is." Yes but would you buy one? "I can't!" comes the reply, "It isn't on sale." I'm in the Suzuki's corner. I love its feel and I can imagine putting loads and loads and loads of miles on it and how calmly we would cover these. "That's what you said about both of the bikes you already own Shumi!," says Halley and suddenly everyone's rolling around in the sand laughing. I just shrug - I'm easy. Halley's a Tiger conservationist now, "I'll get the Triumph. It's smaller in displacement than all of these, but you'd be hard pressed to notice it despite the pace we've kept. I love its narrowness and how competent and enthusiastic it felt even on bad roads. Add that to the lowest price tag here and I'm sold." We turn to Rohit, who's been sitting silently the whole time. He looks up at us, susses out the unspoken question and looks up in thought. And then he just points at the Tiger without saying a word. 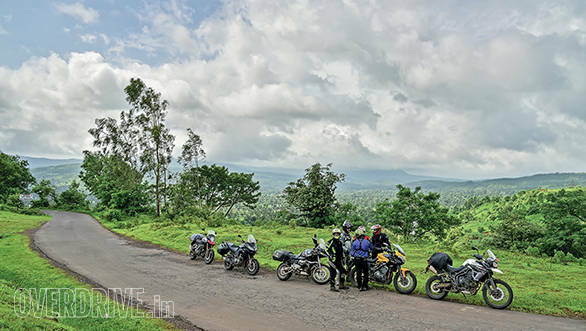 Adventure touring in Maharashtra. . . 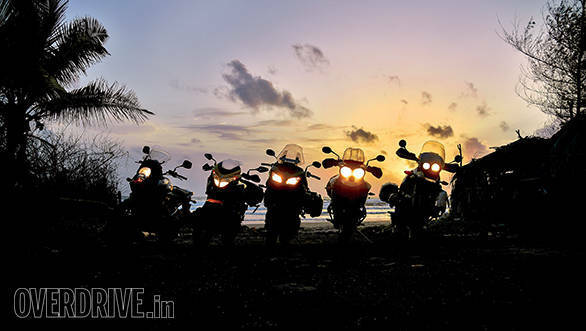 Adventure touring in Maharashtra. . .